My desk, complete with my new gaming PC and several toys. Nothing tests your resolve to identify a certain way like a big, bank-breaking purchase. 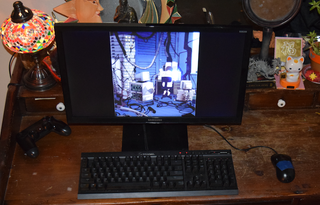 In December, after five years of back-and-forth, I took the dive and bought a gaming PC. Until I was standing in the Micro Center checkout aisle with a big, stately “PowerSpec” box in my cart, I kicked and screamed the whole way there. “Buying in” is a scary thing, especially when your lifestyle is still possible, but significantly compromised, without doing so. Prior to pulling out of the Micro Center parking lot, I played Overwatch or Final Fantasy XIV every day on a powerful laptop that needed some deft jerry-rigging to run new games and, for most other things, loaded up my Xbox One. I didn’t want to drop a month’s rent on hardware. And I didn’t want one of those glowing, green gaming PCs equipped with fangs and pincers. For me, there was also the damningly impossible question of “How much PC gaming is enough to justify a gaming PC?” In the end, it was a simple calculation: an inadequate laptop vs. the royal treatment, minus $1,000. “I’m just checking out some computers,” I’d explain. “Ah, okay. What will you do on the computer?” they ask. Here, I always shortcircuited. It seems like a simple enough computation—play video games, purchase gaming PC. It’s the last thing I mention, and yet, it’s the most important factor determining which tool I will choose to go about my increasingly online life. It’s not just a matter of “next-gen tech” and “powerful gameplay.” It feels, in a way, like this bored, run-of-the-mill Best Buy employee stands before the gate that leads to some gilded tower of PC gamers. It felt like I wasn’t serious unless I was serious about framerate. I wasn’t a player until my walls reflected the soft glow of a blue LED fan. Buying a gaming PC is just as much an investment in who you are as it is in how you’re gaming. Me, with my new friend. But after being hired by Kotaku, how I related to a gaming PC started to change. What seemed like an identity calculation that only transpired in the aisles of Best Buy became part of how I do my job. It’s a sort of insurance for running future games with less difficulty, for being able to get more out of games I already play by having beefier hardware. That’s only half the truth, though. I bought a gaming PC, in part, because I like winning in Overwatch. Since it’s team-based, your teammates know if you’re lagging on your rush out of the spawn point. Also, Overwatch isn’t one of those games where it’s fine for your computer to overheat in the middle of a competitive match. That’s the beast I was wrestling. To play Overwatch on my HP Envy laptop, with its Nvidia GeForce 930M graphics card and its i7-6500U microprocessor, I had to construct a somewhat elaborate superstructure that involved two to three fans and, occasionally, a dictionary. My Envy is not a bad laptop by any means, but four or five matches in, it would get hot and angry and hiss. Most of the time, it would shut down without warning—just a small sigh. Its Overwatch aversion was a little confusing, since it ran all my other PC games just fine—Final Fantasy XIV, most importantly. To appease it, I purchased a cooling pad with a fan inside and a mini fan that sat on my desk and blew into its fan. Sometimes, I put a dictionary under it to get just the right angle or leaned it against some books just so. When none of that worked, I dragged my 4-foot floor fan next to my desk and directed its wind into the desk fan which, in turn, blew into the laptop fan. After a while, my laptop just stopped having it. My bosses eyed me as I made my bi-weekly pilgrimage to Staples, insisting it was time. Staples’ technicians warned me that it was only going to get worse unless I got a rig more suitable for gaming. My first impulse was to build one. I would go on PCpartpicker.com, and, with requisite research, piece together a custom build. It wasn’t particularly intimidating—as Kotaku managing editor Riley MacLeod said, “Building a gaming PC is just like grown-up Legos.” I reasoned that by building my own PC, I would familiarize myself with its internal organs and, if something broke, I could identify the problem myself. It would be an exciting challenge and teach me a new, useful knowledge set. That was my plan, and if you ask my friends, I wouldn’t shut up about it. But on December 26th, while I was home over the holidays, I took my parents’ car to a Virginia Micro Center to purchase a more powerful cooling fan for my laptop, hoping it would hold me over until I mustered the courage to order parts. Micro Center is a vestige of early computing, one of the few brick and mortar computer stores where, in my experience, salespeople always seem knowledgeable, but so are the customers. When I entered, I saw the sign hanging over their desktop section and made a beeline there, forgetting my original task. All of the employees seemed busy, so I could wander around without anybody quizzing me on my gaming habits or dream specs. As I looked over the glowing green towers and jagged, monster-ish rigs, a few larger but more innocuous desktops caught my eye. There was a table with about five two-foot-tall towers, each with at least two ventilation grates and top-notch graphics cards, all under about $1,100—not an insignificant sum, by any means. One in particular, a PowerSpec G313 custom build, had many of the features I wanted out of my own build. I wanted a 1070 graphics card, since a 1080 was definitely out of my price range. It had 16GB of RAM and an i5-6600K unlocked processor. It could handle VR. It had a 480GB solid state boot drive. It was $999. A customer, not a salesperson, approached me. “Hey, I don’t mean to bother you,” he began, “but I have that PC. It’s amazing.” I immediately shot him a dozen questions and, enthusiastically, he explained that, yes, it handles Blizzard games with maxed-out settings and, absolutely, he does not regret buying a pre-built gaming PC. A salesperson joined the conversation, noting that the graphics card alone would cost $500, only $300 less than my DIY price limit. Purchasing each of its parts separately, the PC would have cost about $1,300. Considering the specs, it was a steal. Also, it has space for another graphics card, so if in five years my 1070 wasn’t doing the trick, I could just add another. Perhaps it was impulsive, but I bought it. I took it back to New York and hooked up a discounted, but new, 21” Samsung monitor. I crammed the enormous 18 by 7-inch tower under my desk. The keyboard was a hand-me-down from my dad, who accidentally purchased a Corsair mechanical keyboard for himself off the internet and was deterred by the clanking. My mouse, honestly, I could care less about. I found it in a box in my room. Perhaps it’s all a mindgame. And, undeniably, I was a victim of some very good marketing from the PC gaming industry. I think back before I felt comfortable making this sort of big, meaningful purchase and wonder what was stopping me aside from price—impromptu quizzes at Best Buy, the super-fanatical culture of PC gaming? There are mental barriers-to-entry and traversing them are scary, even aside of money, and especially when they’re reinforced by others who already made the financial leap and constantly seek to justify it. But it’s a sad truth—“buying in” is a way of feeling at home.